Donald Trump: Where's Obama's Birth Certificate? And it's a very valid question. Liberals don't know how to react to Donald Trump's appearance on The View because he's not a conservative, so they can't label him a right-winger or a racist. Of course, this brings up the birther issue and our favorite undocumented President Obama's refusal to show it to the public. The fact remains that Obama hasn't produced his birth certificate and it is really strange. He claims to have all the proof other than the actual document, but for some strange reason, he refuses to release it. Donald Trump is right. Obama, for his own good, should release the document. The hilarious exchange took place on the set of The View, a liberal show with three female yentas, one male yenta, Joe Behar, and the smoking hot Republican, Elisabeth Hasselbeck. What's so strange is that the undocumented President Obama has spent millions of his own dollars defending lawsuits that question his eligibility. Best of all, he could use it to his and the Democrat's advantage and prove once and for all how crazy conservatives are! Yet, he remains speechless. Or taking vacations abroad. Donald Trump asked a good question to his opposition. They were speechless. 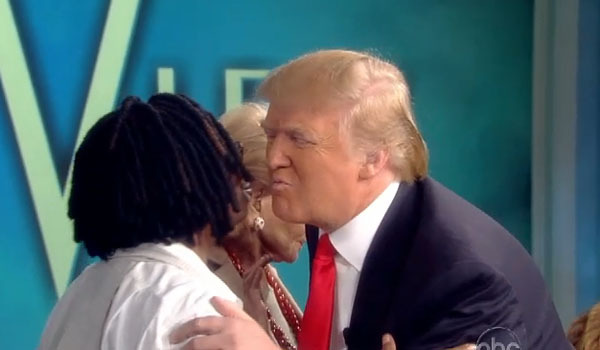 The disgustingly unattractive Whoopi Goldberg almost pulled out the race-card, but then she remembered the two were friends, so that wouldn't fly. That didn't stop the transvestite-loving pervert, Jerry Springer, from calling him a racist on Sean Hannity's TV show last night. Springer, like a typical liberal, uses race when they don't have a substantial argument. It's pathetic, but so are liberals. Since the issue wasn't raised before with white presidents, it's a race issue. The undocumented President Obama brought this issue on himself. He bragged about his childhood in the largest Islamic country by population, Indonesia, and stating publicly that their prayer was the sweetest things his ears had ever heard. His Kenya endeavors didn't exactly help, nor did his wife when she said they "visited his home country in Kenya." Trust but verify. The problem is that nobody knows a damn thing about this guy because everything from his past is more protected than Wikileaks. He's done that for a reason. We already know he's a socialist and don't need to see his college thesis to prove that, but he is legally required to produce a birth certificate to become President of the United States. Again, laws only apply to liberals when they benefit from them. So, come Mr. Undocumented Barack Hussein Obama, why not just prove those "birthers" wrong and produce the birth certificate?